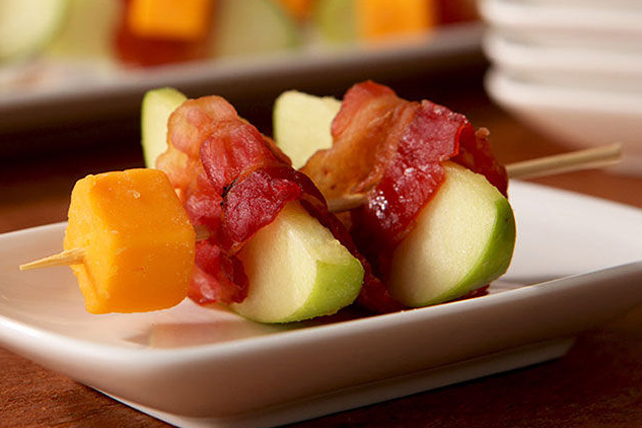 In these awesome little appetizer kabobs, brown-sugared Granny Smith apples add their sweet tartness to cheddar cheese and smoky bacon. Toss apples with sugar in medium bowl until evenly coated. Thread 1 cheese cube, 1 bacon slice and 2 apple slices alternately onto each of 12 toothpicks. This is a fun recipe for parents and kids to make together. If desired, microwave bacon until warmed just before using to assemble kabobs.